The 79th session of the Legislature has begun. For 120 days, senators, assemblymen and assemblywomen will work on initiatives that could become the new laws for the Nevada community. 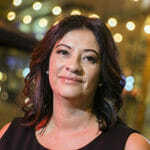 The Nevada Independent – En Espanol is publishing a series of interviews with Latino leaders who hold leadership positions in the Assembly and Senate. These Q&A pieces focus on their respective backgrounds, challenges, and points of view regarding several current issues, as well as how they rank the Hispanic community in importance in terms of their work agenda. We will be providing English translations of those interviews. This is the third interview in the series. Nelson Araujo, Democratic Assemblyman District 3 in Las Vegas. Feb. 9, 2017. Photo by Luz Gray. Q: Let’s start with your Latin roots, so that the readers of the The Nevada Independent can get to know you. A: I was born in Las Vegas, on 28th Street, between Bonanza and Eastern. I am the son of Salvadoran parents. My mother brought my sister and I up single handedly. She’s a housekeeper. She has been working at the same hotel – the Flamingo – for more than 30 years. We never had anything, well as you know, a single mother and all. We never had the luxury of a new car or anything like that, but what she did have was her immense love for us. We never went hungry. We always had a roof over our heads and a shirt on our backs. I always focused on my studies, even though there were problems at home or in the community. I remember when I was a kid, my uncles would tease me because I didn’t like football. I only liked to read. But, one of my uncles, who passed away not that long ago, told me that I was going to surprise them all and maybe one day I would be the president of the United States, because I always had an interest in politics. I lived on 28th Street until I turned 18, the time I went to college. Q: And what was it like in your neighborhood? A: I grew up during the time when the maras (gangs) were there. You could say that it wasn’t the nice end of town. There were always quite a few problems and insecurity, but I always knew those of the community and we looked after each other, so nothing would happen to us. I remember when my mother came home tired from work and she would say that she was making a sacrifice was so that we could realize our dreams. She had to make a sacrifice every day ever since she escaped the civil war blanketing El Salvador. She arrived with a Temporary Protection Status because of what was happening over there. She still tells stories of when she went to school and there were explosions going off. It was very dangerous for them, and I guess because of that she wasn’t able to finish her schooling. My grandparents were ranchers. They always dreamed of doing that. But, unfortunately, their options were to either take the risk by staying there or to send their children to the United States. And this is what they did. Q: How is it that, despite your mother’s situation and having grown up in that neighborhood during the period of the maras, as you mentioned, you got to where you are today? How did you overcome everything and hold office after facing those very adverse situations? A: That’s a very good question. I know it’s a simple answer, but I always credit my mother. She never missed a day’s work. She always was on the lookout for new opportunities for us, even if it meant borrowing money from her friends to pay the rent. She always reminded us that we had an option: to either keep living in the same situation that we were living or, if we wanted a better future, the best way was to keep studying. That was my ticket out. Since I was a kid, I remember telling my mother: “One day I am going to buy you a house. I’m going to make you proud of me,” and I thank God for being the first of her children to graduate from high school, to get a college and teaching degree. But without having studied, I can attest that I wouldn’t have been able to hold this office, because what education does give us is the intellectual power to accept that we are more than what society says we can be. Knowledge is power. I also have the need to acknowledge my high school principal, Mr. Cheston Arancho. After I was elected president of the student body, when I was 16, he took me to the store and bought me two suits. I can recall very few significant events, but this was memorable. He felt a devotion toward his students and the help he provided us was invaluable. So, he bought me both suits and that year I went on job interviews. I was given the confidence to step forward and imagine that I could do something. Q: When did you realize that you wanted to get into politics? I remember that he just kept looking at me and he gave me a broad smile. For the next few months his representatives kept in contact with me and, well, afterward I began my internship at Senator Reid’s office. Then they promoted me to the position of Foreclosure Prevention Supervisor, where I stayed until I left. I would like to say that I remember when I was eighteen and I went to school. I graduated from university after three years and got my teaching degree in one and a half years. Each semester I took on six or seven subjects. After this, I worked the night shift, and the next day I went to fulfill my duties at the internship. After five years, now with my teaching degree, I went out looking for better opportunities and they gave me the position of vice president, here, in one of the largest non-profit organizations that oversees housing matters – the Financial Guidance Center. Coincidentally, during the first month that I began working at this organization, the opportunity arose to implement “Home Again,” a program at the attorney general’s office (at the time, Catherine Cortez Masto). When I moved on from the Financial Guidance Center, I worked at United Way. After two months of working there, I decided I wanted to run for assemblyman. That was quite interesting, because I was Latino, I had no money and I was young. There were many opportunities and, after being well informed following my participation with the entire community, I decided to run for District 3. It was not easy. I had to run against five others in the primary elections and against one other candidate in the general election. 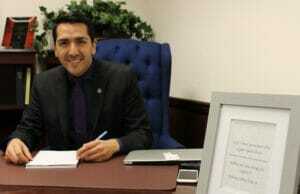 After winning, I was the first Central American and the first gay Latino in the history of Nevada to be elected. I think there are six or seven of us at a national level. There’s only a few of us. Q: And, on that note, I would like to ask you: What are your views regarding LGBTQ issues within the Latino community? Is there still more work to be done? A: There is much to be done, especially for our youth. I think we still need to continue having these conversations with our families about what it is to be labeled as LGBTQ. I understand that for many of us in our communities it is something new and it will take time to learn to accept all differences. I am a member on the board of directors for The Center in Las Vegas and there I get to talk to many young people. And, without coming across as being arrogant, this gives them great joy when they see me and they know I hold this office because when we grow up, after often identifying ourselves as LGBTQ, and not being able to step out of the closet, it makes us think twice about what we can do in life. Q: Will you do something or have you done something in the legislative session for the LGBTQ community? A: Yes. In this session, I personally have two bills: First, to propose a change to the Constitution of Nevada, where right now it states that marriage is bound only between a man and woman and I want an amendment to be made to reflect the equality in marriage. And, the other bill, I want to propose the protection for young people who identify themselves as LGBTQ and that are also members of shelters of the Department of Family Services, so that professionals know how to be aware and that there is protection available in case of discrimination. There are many programs that can be implemented for health, identification and cultural education. Q: And, in a general sense, what drafts will you be working on during this session? A: I have one that focuses specifically on mental health, to ensure that services are available at a local level and provided to people who need it most. I also have one on marijuana for medical use. I know everyone is talking about the recreational side of things, but I want to focus on helping people with health issues. So, I want to make the process easier for them to get this medicine. Q: Following the election of President Trump and the changes he is making, especially on issues of border security and immigration, are you working on a draft that covers the immigrant community? A: I would like to let the community know that we are paying attention to everything that the president is doing and we are looking for any means in which we can, at a state level, to respond to the attacks on all minority communities. I’ll put a put forward a bill to help all people with driver authorization cards. Right now we have over 36,000 people who have benefited from this. These are undocumented families who can now drive here in the state. So, for this session, I want to make an amendment, so that instead of renewing it every year, it is every four years and also so that the number of supporting documents is simplified and to provide more options so, for example, our DREAMers do not have this problem. We’re not sure what will happen with DACA, so I prefer to put this protection in place. Q: What is your favorite Salvadoran dish? A: Pupusas, plantain bananas with beans, and casamiento (rice with beans).